Caging animals is just … wrong, like caging zombies (remember Survival of the Dead?). So I’m really glad they let the cat out of the bag, so to speak, at Zombie Zoo, purveyors of undead animals and creepy critters … in fleece. Apparently zookeeper and creator Neecy Twinem “does not try to ‘keep’ the zombies or even try to tell them what to do. They have their own minds and desires and sometimes ‘keep’ her.” Out of control zombies? Imagine. Well, we know what that’s like. These cuddly creatures are really cute and possibly crib-worthy. There’s Boo, Rob, Toxic, Muck, and Stitch—little zombie, cats, monkeys, pigs, worms (actually I think Toxic is a snake), and bunnies guaranteed to create a sensation at the next baby shower. Bigger kids like them too. 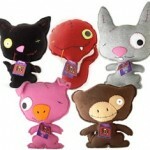 Cute zombies – go figure! 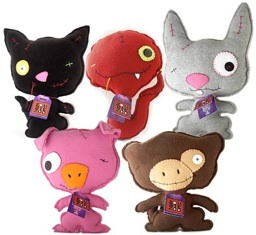 You keep finding these things – perfect for the live little ones who like to squeeze and hug their zombie pets! And the pack above all have 1 eye… metaphor for single mindedness? Search for brains? Mysteries to be solved by The Daily Slice? Stagger on!